We recently described the isolation of a novel influenza virus from swine exhibiting respiratory disease in the United States that is distantly related to human influenza C virus. Based on genetic, biochemical and morphological analysis, the virus was provisionally classified as C/swine/Oklahoma/1334/2011 (C/OK). To further understand the genetics and evolution of this novel pathogen, we performed a comprehensive analysis of its sequence and phylogeny. The results demonstrated that C/OK and human influenza C viruses share a conserved array of predicted functional domains in the viral RNA genome replication and viral entry machinery but vary at key functional sites. Furthermore, our evolutionary analysis showed that homologous genes of C/OK and human influenza C viruses diverged from each other an estimated several hundred to several thousand years ago. 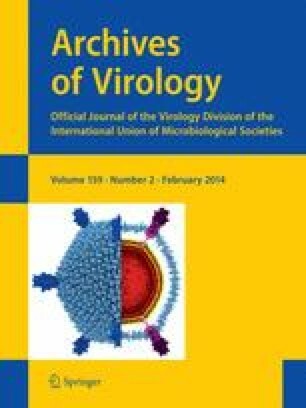 Taken together, the findings described in this study support and extend our previous observations that C/OK is a genetically and evolutionarily distinct influenza virus in the family Orthomyxoviridae. Z. Sheng and Z. Ran contributed equally to this work. The online version of this article (doi: 10.1007/s00705-013-1815-3) contains supplementary material, which is available to authorized users. This research was supported in part by the SDSU AES Fund 3AH203, a Public Health Service grant (AI076125 to F.L. ), and SD 2010 Research Center (Biological Control and Analysis of Applied Photonics, BCAAP) Fund (3SJ163 to F.L.). Research in the S.C. laboratory is supported by the SDSU AES to S.C. and the South Dakota 2010 Research Center, BCAAP (Biological Control and Analysis of Applied Photonics) Fund (3SG163 to S.C.).